Maple-Apple Tarte Tatin: A Vermont Spin on a French Classic | Mealtime | Kids VT - small people, big ideas! In July, I traveled to Toulouse in southwestern France with my mother and sister to celebrate a family wedding. My father's cousin and his daughter live there now, and she was getting married. None of us speaks much French, but we do speak food. When people rave about French cuisine, they are not just talking. There wasn't a culinary dud the whole week. Even the South Hero-sized town we stayed in, Aurignac, had a restaurant that we returned to more than once. We ate delicate fish served in red pepper beurre blanc with bits of zucchini, pork wrapped in puff pastry, mango mousse and more. And of course, there was cheese, bread and wine. Most restaurants had a three-course menu for a very reasonable price that offered a few choices for appetizer, entree and dessert. I was shocked when, perusing the menu options at one restaurant, my mother told me she had never heard of tarte tatin. I urged her to order it, and she was very happy that she did. It's a dish that translates incredibly well to our Vermont palate. 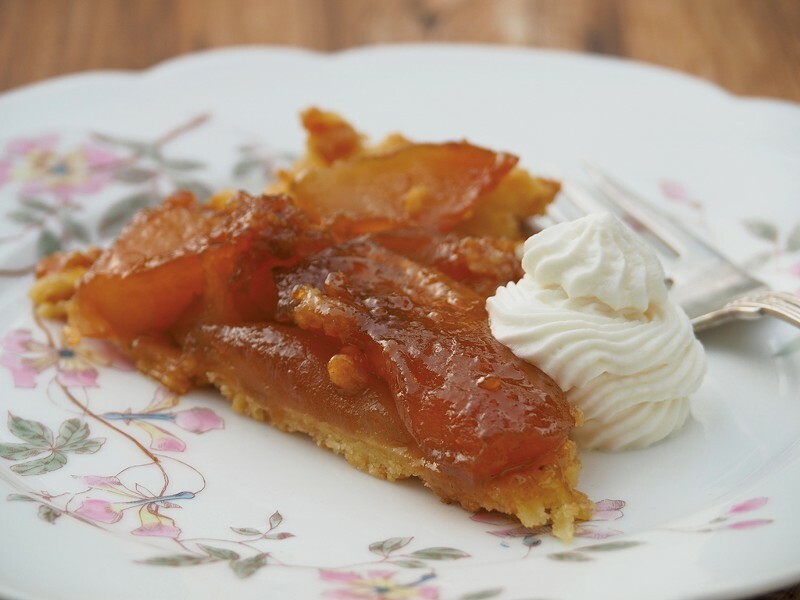 For a culture known for fancy and complicated desserts, tarte tatin is surprisingly simple. Slices of apple swim in rich caramel inside a rustic crust of either shortcrust or puff pastry. The dish was created at Hotel Tatin in a town south of Paris in the 1880s. Once home, with apple season in full swing, I decided to give it a whirl. Because I wanted to be sure that the water content in the apples didn't dilute the caramel, I used a tip I found online: I peeled and sliced them about eight hours before cooking, then left them out to "dry." (You could also do this a day or two ahead of time, and refrigerate them.) The apples may brown a little, but it doesn't really matter because they are going to be covered in caramel in the end. Rather than make the caramel with the apples already in the pan, I opted to simmer the apples in caramelized sugar, so that I could be sure that the sugar cooked properly and didn't burn. I also decided to use a shortcrust, instead of puff pastry, so that it wouldn't get soggy if we didn't eat it right away. And to add a little Vermont flair, I used some maple syrup in the caramel. Because this tarte is cooked upside down and flipped before serving, it is important to use a pan that works both on the stovetop and in the oven. Having a surface that the caramel won't stick to is also key. I love a well-seasoned cast-iron pan, but a nonstick skillet would also work. Flipping is the most nerve-wracking part — but even if the tarte falls apart a bit, it's still going to be wonderful. You may not be able to travel to France, but you can bring France to your table. We've all been enjoying the dinners inspired by our trip, and this was the icing on the cake — or, really, the caramel on the apple. Cut the cold butter into pea-sized pieces. Put it in a food processor with the dry ingredients and lemon zest. Gently pulse until just combined into a coarse crumb. Add the egg yolk and drizzle in ice water as you pulse, just until the dough starts to stick together. Don't overwork; it only needs to form a ball when pressed in your hands. Place on wax paper, and roll out into an approximately ¼-inch-thick circle the diameter of the top of your skillet. Refrigerate for at least an hour. Heat a 10-inch nonstick skillet or well-seasoned cast-iron skillet over medium-low heat. Melt 1 tablespoon butter to coat the bottom. Sprinkle the sugar over the surface of the pan, and add the water, syrup and vanilla. Stir for about 3 minutes over low heat, then add the lemon juice. Continue to caramelize, stirring occasionally, for another 5 minutes. 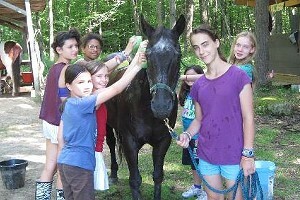 If the mixture begins to get too dark, turn off the heat so it doesn't burn. Add the remaining butter, one pat at a time, and swirl the pan to melt it into the caramel. Remove the skillet from the heat. Lay the apples in the caramel, so that they are densely packed. This will become the top of the tarte, so arrange them in an attractive pattern, trying to minimize holes. Sprinkle with the pinch of salt. Return the skillet to the stove and simmer on very low heat for about 20-25 minutes, lightly shaking occasionally to coat the apples with caramel. 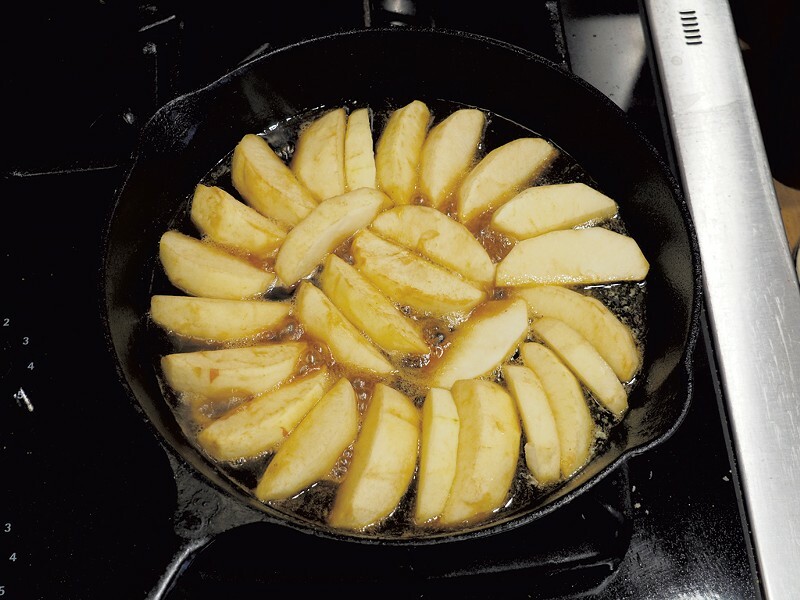 Place the pastry round on top of the caramelized apples, allowing it to drop ¼ to ½ inch over the sides of the skillet. Use a rubber spatula to lightly press down the sides. Bake for 40 to 45 minutes, or until the crust is lightly browned. Allow to cool for at least 15 minutes, then place a serving plate over the skillet and flip over (you may need an assistant for this part). If caramel is stuck in the pan, scrape it out and use it to fill in any holes. Serve with maple whipped cream, if desired.